Having tons of new people downloading your app feels great. But it isn’t all about numbers, especially when your app has a poor retention rate. A sign up or an app download doesn’t (always) mean the user will engage with your app in future. Only 14% of new users return after initial download and only 2.7% users’ stick after 30 days. The industry-wide app engagement after 90 days stands at 4%. The way you present your app to new users and how easy you make it for them to achieve success with your app makes or breaks the deal. When a user downloads an app, the first week is crucial because 55% of users who engage with an app in the first week after download stick with it and retain. This is where user onboarding plays its role. The idea is to let users understand, explore, and get started with your app as quickly and easily as possible. Customer onboarding defines the entire process that a user goes through from getting acquired to becoming a customer and beyond. 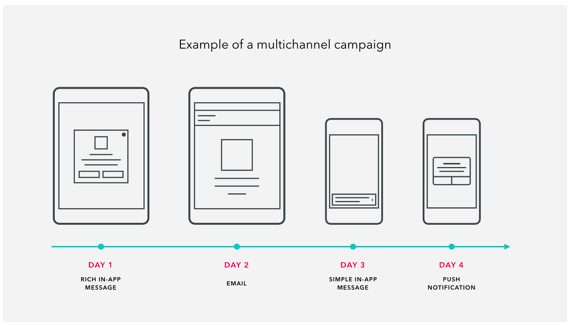 A good user onboarding process has the potential to increase engagement up to 4x. Creating an onboarding process that will actually make users fell in love with your app is no less than a challenge. Not all user onboarding processes are created equal so you have to do a great job to stand out from the crowd. The following seven onboarding techniques will show you how you can make it work for your app and how to create a user onboarding process that will actually boost app engagement and make users stick with your app like glue. You need to show the most prominent benefits of your app to the users in the onboarding process. Obviously you cannot show all the benefits, so you have to pick a few major benefits that make your app stand out from the crowd, and focus on them. Show new users the best benefits of your app so they have no other choice but to continue using the app. You can show these benefits to users before they have signed up for your app (immediately after they have downloaded the app) or after they create an account. The best approach, however, is to show most prominent benefits before registration. Evernote does it in style. 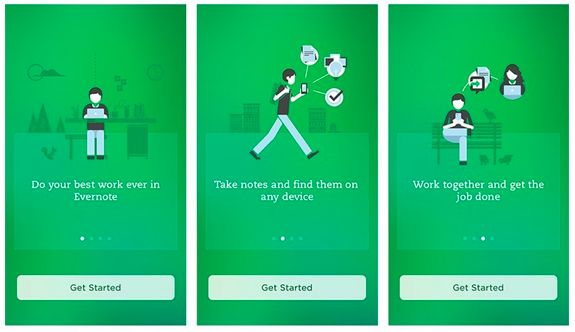 They show new users top three benefits of using Evernote and then ask to create an account. And once a user has created an account, a product tour begins. This onboarding technique ensures that users get to know your app, why it is different, and what big problem it will solve. Make sure you represent a true picture of your app’s benefits at this stage. Don’t create unnecessary hype. Stick with your app’s true benefits that it will deliver. Else, users will churn immediately after sign up. Your app targets different buyer personas. Using the same onboarding process for all the buyer personas you target won’t give that personalized feel to the users. Create a generalized onboarding process (probably to save cost) and use it for every single user. Create highly customized onboarding processes based on buyer personas. Ask yourself, how you’d like to be treated if you used your app? Persona-based onboarding will increase engagement because you’d be in a better position to communicate how your app can provide value. 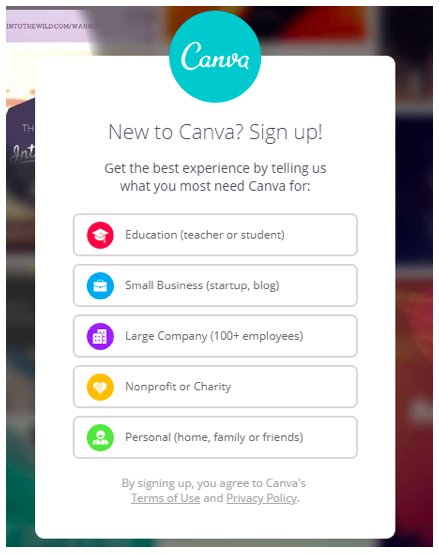 Canva, for instance, asks its users what they need Canva for. You then get to see customized templates. If you choose small business, you’ll see pamphlets, banners, social media posts, etc. It gets easier to help users achieve their first success with your app quickly with persona-based onboarding which happens to be a crucial factor whether a user will stay or churn. When a user downloads your app, there is something they want to achieve with your app. There is a reason why anyone on this planet will download an app. It could be to solve a problem, get information, for fun, or something else, and it’s up to you to make it easy for them. The moment a user achieves their first success with your app (the reason why they downloaded the app in the first place), customer engagement increases significantly. 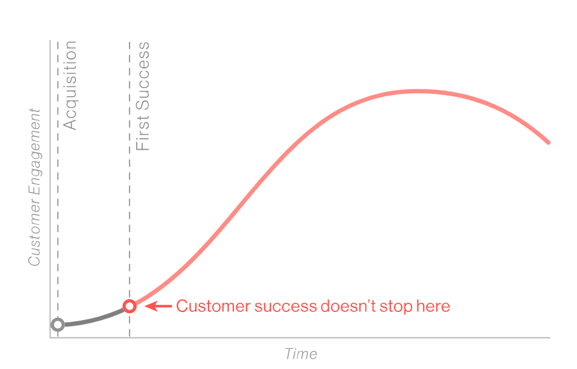 A user who achieves their first success with your app quickly is more likely to stay. If a user is unable to get that initial success with the app, they will churn. Design onboarding process in a way that it helps users achieve their first success immediately when they first use your app. 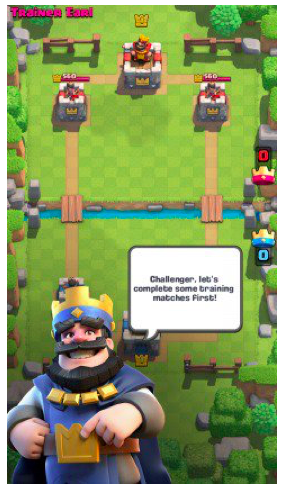 Clash Royale makes it super-easy for its users to achieve first success with the game. 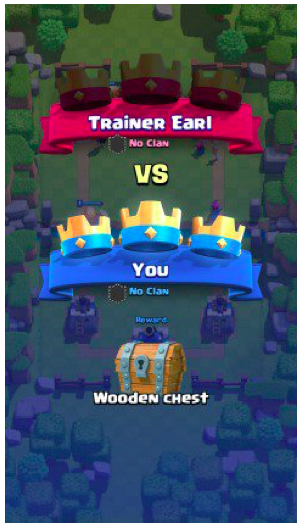 After sign up, users get straight into a mock battle. Users win their first battle right away and this is how they achieve their first success. Design your onboarding process in a way that it should push users get to their first success quickly. If you can do this, better retention will follow. One common reason why app users don’t come back is that they don’t understand how to use it. A tutorial-based onboarding process seems to be a perfect fit for any app that guides users what they’re supposed to do to achieve first success and how to get started with the app. 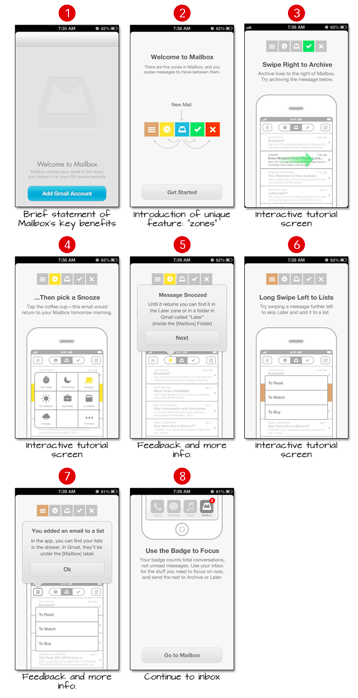 Here is how Mailbox guides its users in eight quick steps how they can use the app. It doesn’t cover every feature; rather, it focuses on core features. At this stage, you just need to guide users to get started; you don’t have to create a 20-step tutorial that will show them every single feature of your app. The above methods help teach new app users so they don’t feel left alone. A sign up or registration form is part of many onboarding campaigns. Sign up processes are used to capture leads, so they have to be simple, short, and should be used at the right time. Sign up processes improve conversion rate as well as user engagement. It has to be one killer sign up process that users cannot refuse to fill. 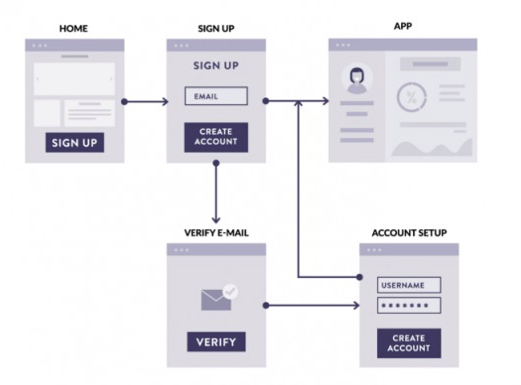 There are three different sign up flows that you can use for your app, according to ConversionXL. 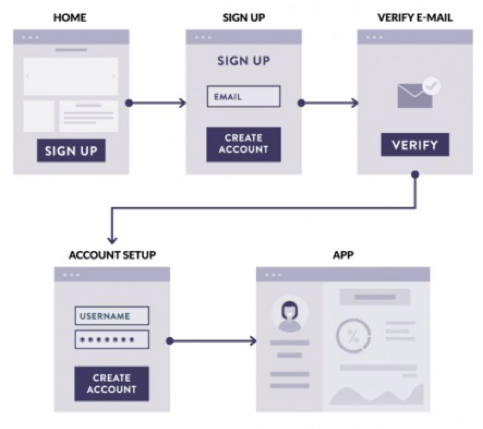 This is the most used sign up flow where users have to create their account, verify their email address, and then they get access to the app. If you have a new and relatively unknown app, you don’t have to use this flow. 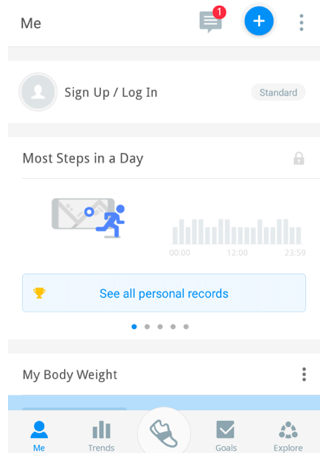 Users won’t like getting registered upfront before seeing the app. Users have to enter their email address but they’re given access to the app immediately after they enter their email address. The sign up process can be completed later. 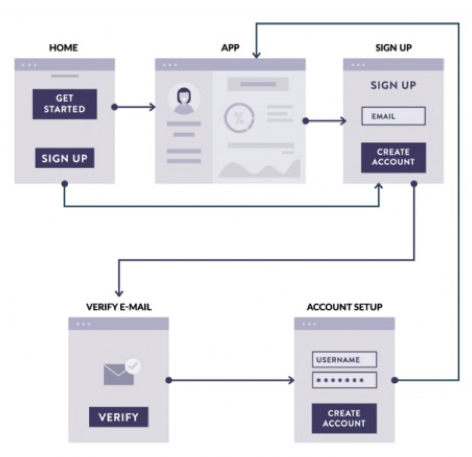 This sign up flow is conversion-focused and should be used when you’re running a mature app that people already know about. This happens to be the best and recommended sign up flow where you give full access to your app prior to sign up. It works best for new apps because people get to see your app first and if it is appealing, they will sign up without hesitation. Better yet, when you give full access to your app upfront, it lets users enjoy their experience resulting in better user engagement. Making sign up process optional is the best way to boost engagement as users get a chance to explore your app without any hurdles. 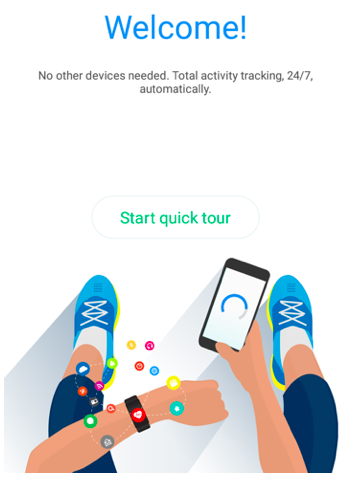 Pacer Pedometer app doesn’t bother its users with sign up requests. New users get to see their onboarding process by taking a tour of the app. If everything looks fine, users can sign up if they want. If you intend to double signups for your app and boost app engagement, the best way to move forward is to push your sign up process at the end of the onboarding process. This isn’t all, the way how you create your sign up process will greatly impact user engagement. A long and lengthy sign up form is something users don’t appreciate. 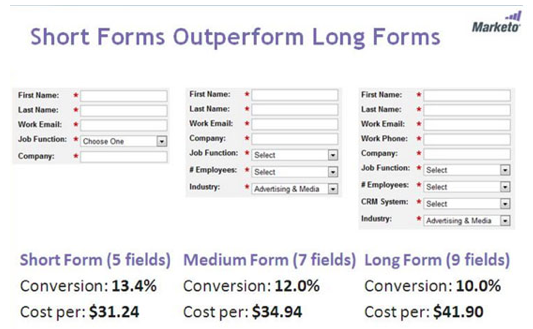 Short forms always outperform long forms. When creating sign up forms, make sure you keep them short and stick with the basic information. This is what makes users happy. Do you use targeted and customer journey specific push notifications during onboarding process? You should because sometimes users need a push that will remind them of what they’re missing. Push notifications increase app engagement by a whopping 88%. Statistics also reveal that 65% of users return to an app within 30 days of receiving a push notification. 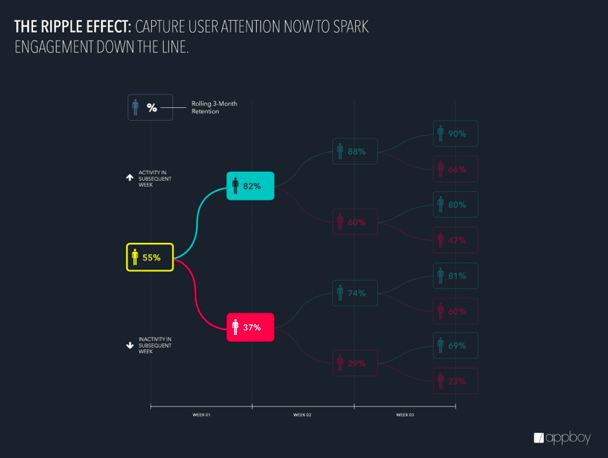 Generally, sending push notifications increase app retention rate by 10x. When it comes to sending push notifications to increase app engagement, you have a lot of options to choose from such as you can send reminders, send an update, send a goal, nudge users, and more. For instance, if a user hasn’t used the app after sign up, a push notification highlighting one prominent app feature might work. On-screen guidance isn’t just enough, setting up an auto-responder to interact, train, and remind users during early days help boost app engagement. Emails also happen to be a part of your onboarding process. Sending an email to app users in the first week of installing the app increases customer retention by 130% in two months. During those early days, new app users can get into several problems. You have to make sure they don’t stop using your app. 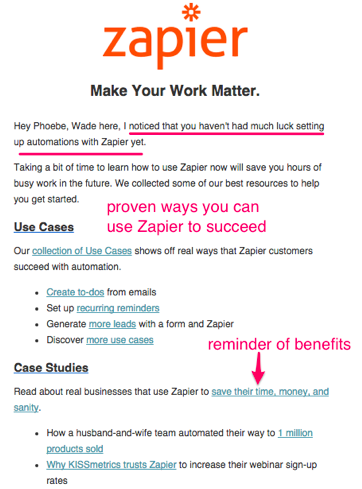 Here is an email that Zapier sends to its users when they have issues getting started. A personalized and targeted email like this is sure to bring users back. The purpose of your email follow up sequence should be to help new users get their first success with your app immediately and bring them back after they have gone through the entire onboarding process. The moment you leave them alone, they will churn. A powerful user onboarding campaign won’t solve all customer engagement issues. It is just one way to boost user engagement, increase app retention, and to improve app stickiness among several others. These seven user onboarding techniques are sure to help improve engagement in those early days when users need you the most. Don’t leave them alone when they need you, and they will not leave you when you need them. The post 7 Onboarding Techniques to Boost App Engagement appeared first on Apptentive.